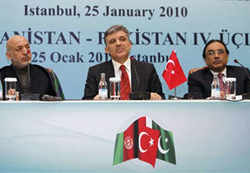 From left: Afghan President Hamid Karzai, Turkish President Abdullah Gul and Pakistani President Asif Ali Zardari. The presidents of Afghanistan and Pakistan met in Istanbul on Monday for a trilateral summit hosted by Turkish President Abdullah Gul. The talks are the fourth round sponsored by Turkey between the two countries since 2007 and take place ahead of the London Conference on Afghanistanwhich begins tomorrow. The summit included meetings between the education ministers, as well as the chief military and intelligence officials of the three countries. Joint projects promoting regional economic cooperation, development and security emerged from the summit as well a regional conference hosted by President Gul, titled Istanbul Summit of Friendship and Cooperation in the Heart of Asia. In addition to Afghan President Hamid Karzai and Pakistan’s President Asif Ali Zardar, China's Foreign Minister Yang Jiechi, Iran's First Vice-President Mohammad-Reza Rahimi, Russia's Deputy Foreign Minister Grigory Karasin, Britain's Foreign Minister David Miliband and Paul Jones, deputy to U.S. special envoy Richard Holbrooke and officials from the European Union, NATO, Saudi Arabia, Tajikistan and the United Arab Emirates were also in Istanbul for the meetings. During the summit, President Gul emphasized the importance of a political settlement apart from a military solution in Afghanistan and pledged Turkey’s role in such efforts. Historically enjoying friendly relations with Afghanistan and Pakistan, Turkey currently stationed nearly 1800 troops in Afghanistan and holds the ISAF regional command in Kabul. Turkey has twice before held command of full ISAF Force. Turkey’s support for the NATO mission in Afghanistan has made it a target for Al-Qaeda, which has issued threats against Turkey. In a national crackdown against the terrorist network, Turkey arrested 120 suspected militants over the weekend.